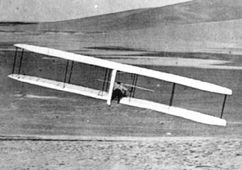 ver one hundred years ago, Wilbur Wright discovered a method for controlling an aircraft in flight that history now remembers as "wing-warping" or the "aileron principle." Wilbur and Orville had already grasped the theory behind this method some months before. After reading a book on the mechanics of bird flight, they observed buzzards circling above the Great Miami River. Will and Orv determined that a bird rolls left or right by changing the angle at which the wings meet the wind, tilting one up and the other down simultaneously. (See An Inkling of an Idea.) They tried to design a mechanism that would do this on a glider, but their initial attempts were too complex and heavy. Wilbur had hit upon what engineers call the "elegant solution" to his and Orville's control problem. 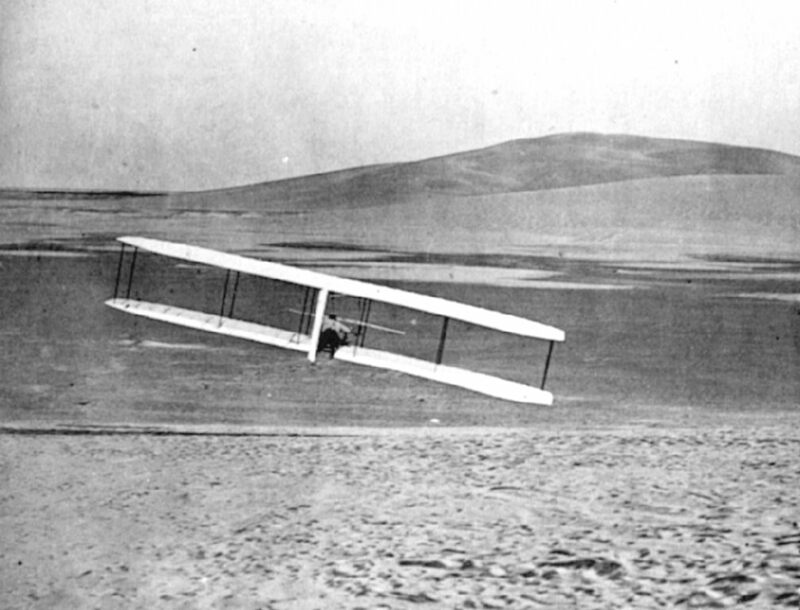 It was not the most important discovery the Wright brothers made, but it was the first and possibly the most thrilling. The elation of having stumbled upon an effective solution to a problem that had eluded men for centuries was the hook that drew the brothers on to seven years of painstaking, dangerous work. 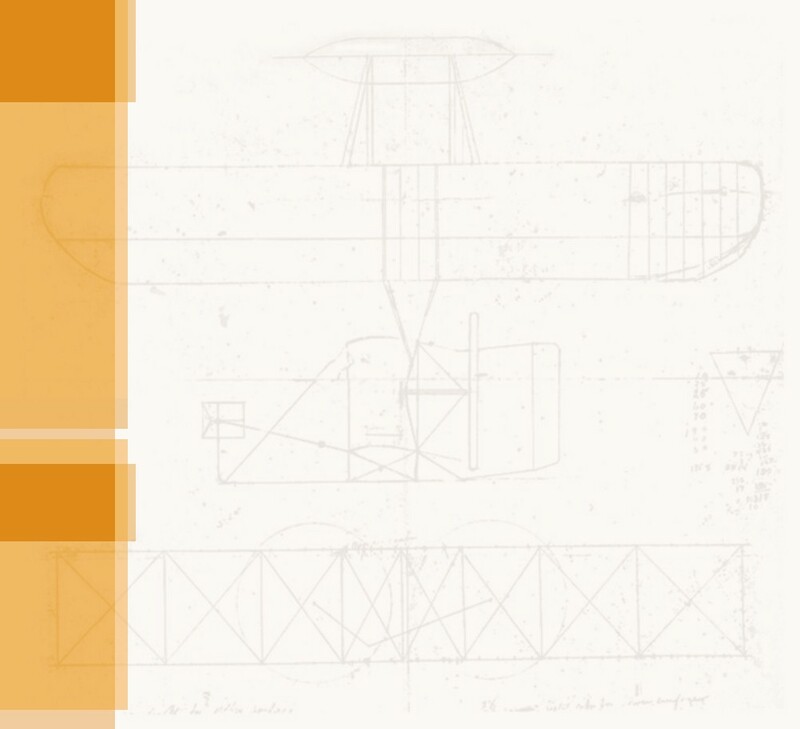 This was the first of a long series of thorny aeronautical problems the brothers had to solve one by one until they at last arrived at one of the most elegant machines of all time -- the world's first practical airplane. ... squeeze two sets of corners together. Click on the photo to see what we mean. Wilbur and Orville used this phenomenon to control their airplanes. They twisted the wings, tilting one side up and the other down. The "up" side produced more lift than the "down" side, and the airplane rolled right or left. To repeat Wilbur's experiment, you'll have to make your own 1899 inner tube box. You can't just use a modern inner tube box; they aren't the same. 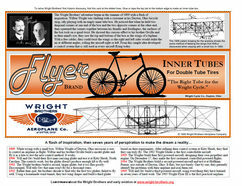 In Wilbur's day, inner tubes were long rubber cylinders whose length equaled the circumference of the tire rim. They weren't joined end to end to make a donut shape. These tubes were folded up and slid into long, slender boxes. When you fold up modern donut-shaped inner tubes, they fit best into short, squarish boxes. These are difficult-going-on-impossible to twist. Wilbur might never have discovered this method of wing warping if early inner tubes were donut-shaped. 1. Download the PDF image of the design. Right click on the thumbnail to the right and choose to save the file to your desktop or another convenient place on your hard drive. 2. Open the PDF in any PDF viewer such as Adobe Reader. Print out the image on 8-1/2" by 11" card stock in the landscape mode. If you don't have card stock, print it out on ordinary paper and then paste it to a piece of thin pasteboard with rubber cement or spray adhesive. 4. Fold the card stock or the pasteboard on the dotted lines. Here's a tip: To help make crisp, straight folds, score the stock with the dull edge of a table knife. Don't cut through the stock; just crush the paper fibers along the line you want to bend. Use a straightedge to guide the knife. The scored line will be much easier to bend and the bend will be much neater. 5. There should be a 1/2"-wide tab at the top of the printed box stock. Glue this tab to the inside surface of the box, even with the bottom edge. This will form an open-ended box. You can also use tape or staples to assemble the box, but glue works best. Download this box design to print your own inner tube box. Score the stock with the blunt edge of a knife to make crisp folds. Glue the tab at the top of the stock to the bottom surface to form a box. To make the make your inner tube box twist as Wilbur did, you must hold it just right and squeeze the proper corners. 1. Hold two diagonal corners on the one end of the box between your thumb and index finger. With your other hand, hold the two opposite diagonal corners in the same manner. 2. Gently squeeze both sets of corners together. The box will take on a spiral twist (also called a helicoidal twist). 3. To twist the box in the other direction, shift your grip so you holding the opposite sets of diagonal corners. Then squeeze. Or, if you don't want to let go of the box, simply spread the corners that you're already holding. This brings the opposite set of corners together, and the twist reverses itself. 4. Look at the box from the side as you squeeze and spread the corners. Wilbur saw the top and bottom of his box as the wings of a biplane, each side presenting itself at a different angle to the wind. This, he knew, would create a difference in lift. When the wings were twisted, one side would have more than the other. The side with increased lift would rise, while the side with decreased lift would sink. This would cause the biplane to roll right or left. He showed this to Orville, and the two brothers decided to build a model glider to test Wilbur's idea. Wilbur flew the model as a kite in late July 1899. And it worked. Hold the box as shown. Gently squeeze the corners together to twist the box in one direction. Spread the corners to reverse the twist.